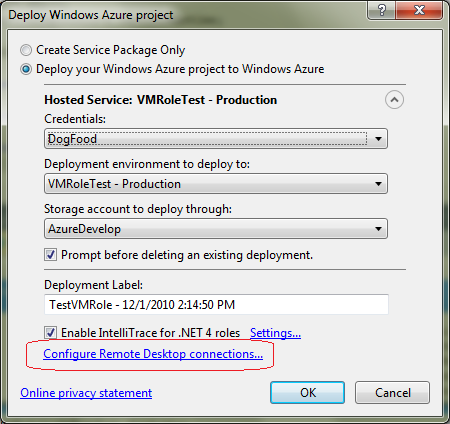 The latest Azure SDK 1.3 makes it possible to login to the VM of your web/worker role instances via Remote desktop. So you are not limited to use VM Role in case you need to establish a RDP connection to your VM. 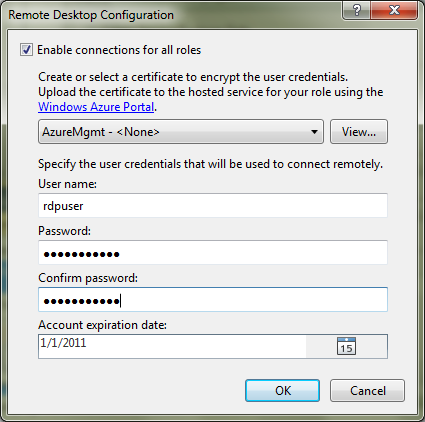 The steps to enable and configure remote desktop are really simple. 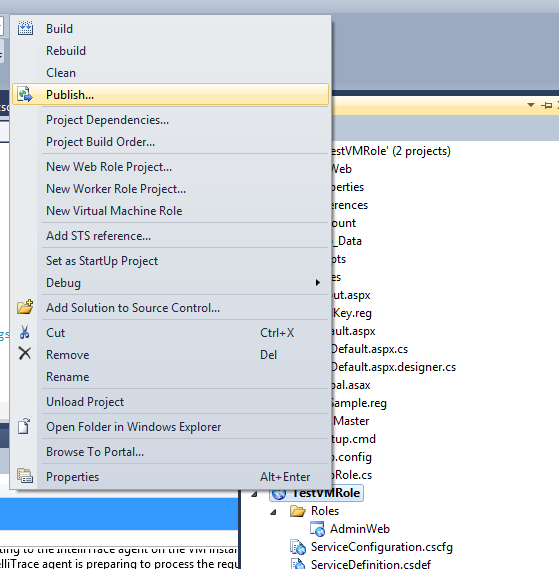 First you will need to install the latest Azure SDK 1.3 tools for Visual Studio. You can just install VSCloudService.exe as it contains SDK as well. 1. 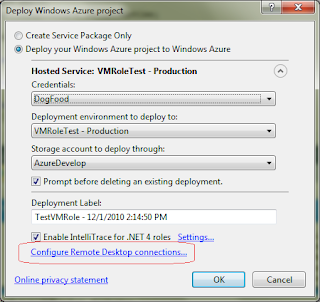 Go to http://windows.azure.com and create a new Hosted Service. 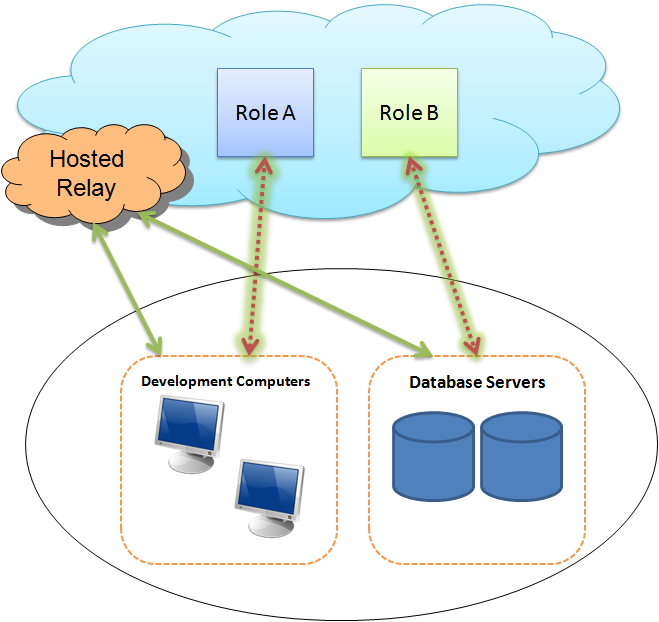 This hosted service will be the one where you will deploy your roles. 2. Create a pfx certiciate and export its private key. If you already have the certificate then upload that certificate to your service else upload the certificate you just created. 3. Then in Visual Studio, Right Click your service and click Publish. 5. Enable the checkbox for "Enable connections for all roles". 6. Select the same certificate that you uploaded to your service in step 2. 7. 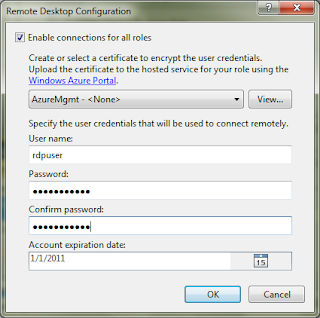 Enter username, password and expiration date for the credentials that you need to use for remote desktop log in. 8. Click Ok and Publish. 9. Now go back to the portal, select the instance and click on Connect button at the top. This is it. You are done You can optionally save the rdp file you get in the last step to your desktop to connect to your instance without going to the portal again. You might already be aware that you can set an upper limit for your SQL Azure Database. This way we can specify that your database size should not grow beyond this upper limit, to avoid being billed without your knowledge. Not only this you will not be billed based on your cap size, rather you will be billed on the basis of the storage you are currently using. You will be charged for the range within which your database size lies. What i mean by this is, we have different ranges in SQL Azure on which we are billed : e.g. For the web edition those ranges are 0-1 Gigabytes, and 1-5 Gigabytes. These are different for Business Editions. So, suppose you specify your cap size to be 5 Gigabytes, and you are currently using around 0.6 Gigabytes of storage. Then you will be charged based on the range 0-1 Gigabytes. However, when your database size increases, say above 1 Gigabytes, your database grows automatically till the cap size. This time you will be billed for the range 1-5 Gigabytes. The database will stop growing automaticaly when it reaches the cap size you specified. This excpetion can be caught in your C# code based on the Exception number of 40544. One limitation to auto growth is that SQL Azure currently will not let you switch between web edition and business edition. To automaticaaly change the cap-size based on growth and to switch from Web Edition to Business Edition some code is required. HTTP Error Code: 400 Message: No tenant signing key of type X509 certificate is provisioned. Message: No tenant signing key of type X509 certificate is provisioned. This is caused because your token signing certificate is not configured properly. In order for Federation Metadata to work, this signing certificate should be configured for Service Namespace. You have to do this by selecting the value in "Used For" set to "Service namespace". To perform this under your Service Namespace, select 'Certificate and Keys' and then in "Token signing Key/Certificate" under Used for select "Service namespace". This will solve the issue. Access Control Service will use a Service Namespace certificate or key to sign tokens if none are present for a specific relying party application. Service Namespace certificates are also used to sign WS-Federation metadata. For SAML tokens, ACS uses an X.509 certificate to sign the token. ACS will use a relying party's certificate, if the relying party has its own certificate. Otherwise, the service namespace certificate is used as a fallback. If there isn't one, an error is shown. The Appfabric ACS needs a service namespace certificate configured in order to sign Fed metadata. Without this, the Fed metadata cannot be signed and attempting to view it will fail. An application that accepts tokens from an STS is called as a Relying Party (or RP). In modern scenarios, web applications use WIF and accept tokens from an STS to manage authentications process. These tokens acts a proof that user has been authenticated by our application. Thus, our application relies on an external service i.e. an STS to provide Access Control and thus our application is termed as a Relying Party. More Explanation about Security Token Service. The security tokens generated by STS contain various attributes based on which a grant/deny access is provided or based on which user experience is customized. These attributes are called as Claims. A claim can be a user name, user’s email, it can even be permissions such as canWrite, canRead etc or it can be roles or groups to which the user belongs. When an STS generates a token, it embeds the claims within it; therefore, once a token has been issued the values of these claims cannot be tampered with. If our application trusts the STS that issued this token, it uses the claims issues by the token to describe the user, thus eliminating the need to look up user attributes to provide authorization and customization. Traditionally, access control was implemented within the main application by writing a code against user’s credentials to authenticate them and based on their attributes grant/deny access to various resources. This required application developers to be skilled in implementing security and writing a code which is hard to implement and maintain. Due to Windows Identity Foundation (WIF) all this has changed and it made the things much easier. WIF externalizes authentication and thus application designers can focus only on implementing Business Logic. So, instead of implementing authentication in our application, we use an external system to provide authentication. This system is nothing but a service, which generates secure tokens and transmits those using standard protocols such as SOAP. This service is known as Security Token Service or STS. Our application is configured to accept these tokens generated by STS. These tokens act as the proof of authentication of a user and hence there is no need for our application to manage these credentials. In this case, our application acts as a Relying Party. The tokens generated by STS also provide attributes of these users which can be used to prevent access to resources and customize user experience. These attributes are called as Claims. Well, i was just over with integrating AppFabric ACS with windows azure cloud app, using the August release, and now i hear that September release is out. September release of AppFabric ACS contains incremental updates including support for OAUth 2.0 Web Server, additional support fpr X.509 certificates, ability to upload WS-Fed metadat through portal, expanded support for machine keys. You can read the announcement at Windows Azure blog. Documentation and updated samples are avaialble on CodePlex project: http://acs.codeplex.com. After all initial hiccups and with the help of MSDN forums and Justin Smith and Vittorio Bertocci's Blogs i have been able to integrate my web role with AppFabric ACS Labs. What i implemented is just Single Sign On with Windows Live ID. Yes, only one Identity Provider, though i could have opted for Facebook Connect, Google and Yahoo too. My next target is to implement ADFSv2 with Appfabric ACS and put it into cloud. Will update how i was able to do that soon. When i started working with ACS on Appfabric I kept on encountering various terminologies, one of them was Passive Federation and it was widely used. I could understand the term Federation but passive was not clear to me ever. So, I did some research and finally got an answer by Vittorio at Vibro.net . The term Passive refers to all those requests that are made by a requestor which is not capable of producing proper SOAP request, for example Web Clients. This means all Web clients are Passive Requestor. Passive Federation emulates WS-Trust on top of GET, POST and cookies. This involves multiple redirects involving browser, resources, requestor and cookies. Check the diagram by Vittorio for details. At Present whenever someone refers to WS-Federation it simply means Passive Federation, as Active requestors are capable of handling WS-Trust directly. So now if we are implementing Windows Live ID single sign on in a our application, may be by using Appfabric ACS Labs we essentially mean Passive Federation. I will be shortly talking about my experiences with AppFabric ACS Labs. If you will get an error like this "locked held by distributed in doubt transactions for some transaction id". Please follow the following steps to recover from locking. Try to find out the locked transaction id from the server error logs. Execute select * from dba_2pc_pending in DB console. You should be able to see the particular locked transaction Id under "local_tran_id" column, and "state" for this should be PREPARED in dba_2pc_pending table. Login to the database as sysdba. Execute the following command - sqlplus './as sysdba' rollback force "locked transaction id" Now if you will check dba_2pc_pending table again, the "state" should be changed to FORCED ROLLBACK for the transaction id. Now you should not get the above error any more. You can also execute commit force "locked transaction id" to avoid this error. Windows 7 powered PC is better than Mac. I agree with this new campaign that Microsoft has started. Microsoft added a new section to their Windows 7 site titled "PC vs Mac". It's the first time i have seen Microsoft going this way of directly marking their products as better than those of their competitors. Apple has been doing this for past 4-5 years in more than 60 campaigns targeting "Get a Mac". Well, now when i see what Microsoft has mentioned as comparison i am in total agreement of what they have to say, especially when it comes to most popular Games not available for Mac and the entertainment options that Microsoft has. I know number of people who buy MAC just to show off that they are different from other or to show off that they are gadget freaks as they can afford a MAC. However, in their hearts they know how good their so called gadget is. HAVING FUN: Macs might spoil your fun. There are some things you simply can't do out of the box with a Mac like watch, pause, rewind, and record TV like a DVR. You can't get a Mac that ships with a Blu-ray player, TV tuner, Memory Stick reader, or built-in 3G wireless. You can with PCs running Windows 7. Most of the world's most popular computer games aren't available for Macs. And Macs can't connect to an Xbox 360. PCs are ready to play. Most Macs can't hook up to your TV unless you buy a converter dongle. Many PCs running Windows 7 are designed to connect directly to TVs, so you can watch movies and see photos on the big screen. WORKING HARD: Macs don't work as well at work or at school. If most of the computers in your office or school run Windows you may find it harder to get things done with a Mac. If you use Apple's productivity suite, sharing files with PC users can be tricky. Your documents might not look right and your spreadsheets might not calculate correctly. You'll have to buy a separate hardware dongle to plug your Mac into a standard VGA projector. Most PCs with Windows 7 hook up easily. On a Mac, out of the box, you can only encrypt your home folder. With Windows 7 Ultimate, you can encrypt your entire hard drive and even USB drives. So your stuff can be safer wherever you go. SHARING: Macs don't like to share. At least half the fun of having a computer is sharing the stuff that matters to you with other people. This is harder to do on a Mac. With a Mac, it's harder to set up secure sharing for your photos, music & movies, documents, and even printers with other computers on your home network. With HomeGroup, it's easy to connect all the computers in your house running Windows 7. It's easy with a PC. On a Mac, you have to manually set up photo sharing, manually set up music and movie sharing, manually set up file sharing, and manually set up printer sharing. It's easy to automatically and securely network with all the computers in your house when they're running Windows 7. CHOICE: Macs don't let you choose. PCs give you a lot more choice and capabilities for your money. You can get the PC you want, in the size and color you want, with the features you want. You just don't have as many options with a Mac. You can't get a Mac with a Blu-ray player, TV tuner, Memory Stick reader, or built-in 3G wireless. PCs running Windows 7 often come with features that aren't available on even the highest end Macs, including Blu-ray, eSATA, multi-format card readers, Touch, and mobile broadband. Macs only come in white or silver. PCs are available in a full spectrum of colors across a range of price points. With PCs running Windows 7, you can play the videos and music stored on your home PC while you're on the go, for free. Apple charges $99/year for its online service. It was showing “Not connected” in weblogic user interface also. While creating the MDB in eclipse 3.4.2, it was found that there is no annotation regarding the queue name details. So, you need to add one more annotation “mappedName”. See below for more details. The “mappedName” should be the JNDI name of the queue. In Moss 2007 we have the pages such as AllItems.aspx which are used to view the contents of a List or a document Library. Similary, the page AllForms.aspx is used to view all the Forms in a Forms Library. So as we have other pages Editform.aspx, DispForm.aspx. Now if you have enabled anonynmous access on your system, then these forms are viewable for all the users, no matter if they are registered users or not, by simply typing the url. However, these pages should be viewable only for the Admin users. So what's the trick? One way is to go to each of these forms and add server side code blocks to check if the current user is Admin or not and depending on that redirect them to home page or may be login page in case of anonymous users. That's what i did initiall, but later found out an easy out-of-the-box solution available with Sharepoint 2007. You may have to first switch to the bin directory containing stsadm.exe and then change the text with your site collection's URL. Also, you may have to give the full path for the feature ViewFormPagesLockdown\feature.xml. After you run this command, disable the anonymous access and enable it back again. In case you want to go deep into this feature then follow this MSDN Blog Post. During my stint with Load Tests in Visual Studio Team System, I was able to successfully run my Load Test, but after i configured the Rig and edited the configuration file i started getting following error whenever i ran the test. After trying various things i finally found out it has to do with the Hosts entry in the configuration file. There exists an entry for Smart Device under Hosts section in the local configuration file. In Solution Explorer, under Solution Items, right-click the test run configuration file (file with extension .testrunconfig) and then click Open With. Choose a program to open the file, such as XML Editor, and then click OK.